Hyper Cutter: Prevents the Attack stat from being lowered. This Pokemons metal ears can vibrate at high speeds. Its believed to be sending out a coded message through the sounds they make. Must level up while holding Scrap Metal. 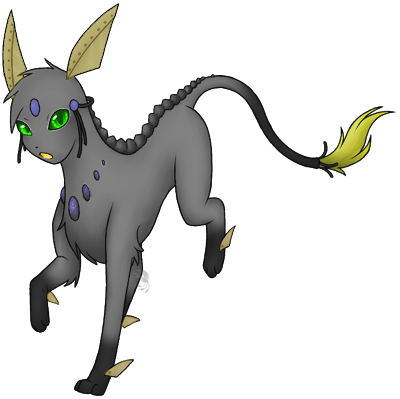 Oreon is one of the larger eeveelutions. It has keen eyes sight, able to see in even pitch black environments. The pokemon is normally found around old abandoned mines where they used to dig up Iron Ore. Its not aggressive in nature, but is not afraid to attack if provoked or is defending its territory as well as if it believes it has been threatened. Its able to use its steel hard plates on its paws and ears to cut through obstacles that get in its path. Though the fur coming out of its tail looks soft to the touch, it is actually very rough and can draw blood if touched the wrong way.